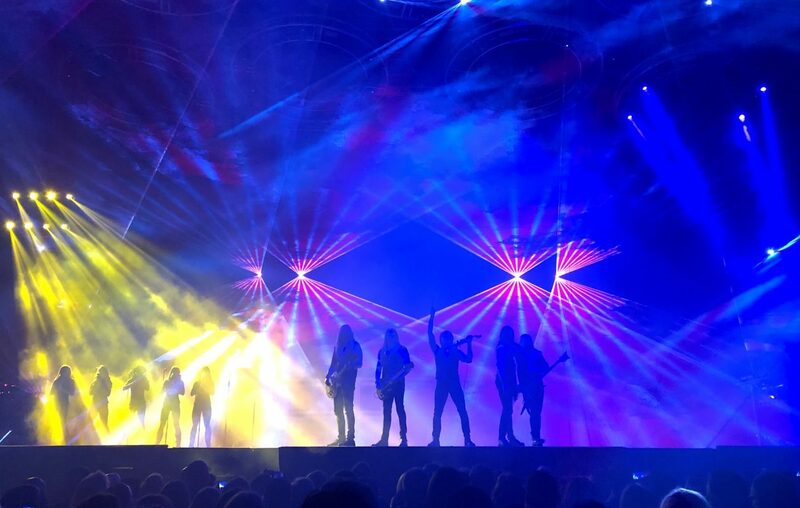 Should there be any opening slots in the rollicking road show that is Trans-Siberian Orchestra, a notice could read: musicians must have long hair, be able to play in the prog-rock style while smiling and in a low runner’s lunge, plus move from stage to gigantic scissor lift at back-of-house quickly. Singers must also have flowing tresses and be buff. Applicants must be able to remain unfazed by frequent bursts of pyros onstage scant inches away from one’s person. Trans-Siberian Orchestra played two shows of their “The Ghosts of Christmas Eve” at KeyBank Center on Dec. 15, both nearly sold out. A box office employee, prior to the 3 p.m. show, said that 600 tickets remained. As ticketholders for upper seats streamed in, those with floor seats waited by locked doors for nearly half an hour: a venue worker said that folding chairs were still being set up. Actor Bryan Hicks, introduced by Caffery later in the show (as were all the musicians and singers), tells the story of a runaway girl, paired with a projected video version of the story. Interspersed are songs melding holiday classics and rock. “What Child Is This” gets TSO treatment with projections of spinning clouds and what might be magma deep inside the Earth. Orchestral members appear, disappear and reappear; portions of the stage may rise heavenward. Following rousing 1930’s-era “Carmina Burana,” the ensemble paid tribute to late TSO founder Paul O’Neill, who, Caffery said, “Wanted every person to have one perfect moment in their lives, he created all of this for all of you.” End of show “Requiem (The Fifth),” Beethoven/Vegas-esque dance number, like the rest, is a sonic cathedral visit and an immersive science experiment in mad holiday decibels.